AndroScience’s (ASC) pharmaceutical pipeline is supported by two novel small molecule therapeutic platforms, each consisting of lead products derived from a larger portfolio of compounds and offering second generation drug candidates. Each of ASC’s core platforms possess medicinal and administration route properties which allow for pursuing several distinct clinical indications in parallel. 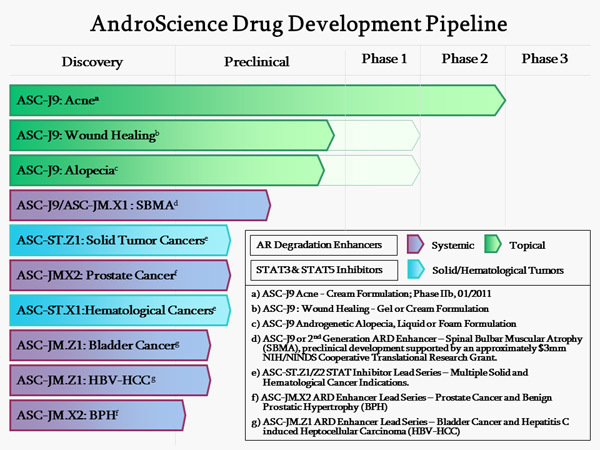 ASC’s pipeline spans preclinical stages of drug development to phase IIb clinical status. All ASC drug candidates have extensive patent protection in domestic and international markets.